Twenty-six years after the NBA banned Nike's Black/Red Air Jordan I from being worn on the court, Jordan-endorsed athletes are still paying fines for footwear that doesn't meet uniform guidelines. The more things change, the more they stay the same. Twenty-six years after the NBA banned Nike's Black/Red Air Jordan I from being worn on the court, Jordan-endorsed athletes are still paying fines for footwear that doesn't meet uniform guidelines. This time around, it's San Francisco 49ers wide receiver Michael Crabtree, who was reportedly issued a $10,000 citation for the golden Jordan BCT Speed Low PE cleats he wore against the Pittsburgh Steelers on December 19. NFL policy states that a team must choose a "dominant color," black or white, for shoes prior to July 1. While gold is clearly a part of San Francisco's uniform color scheme, the cleats were not pre-approved. For Saturday's game against the Seattle Seahawks, Crabtree switched to a black and red pair. 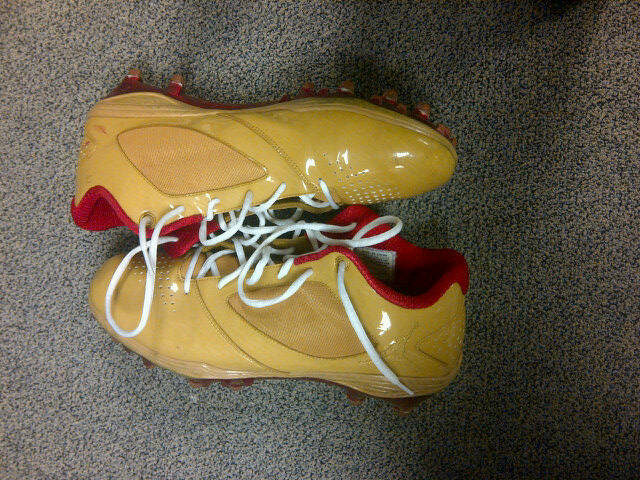 Check out a photo of the "controversial" cleats tweeted by Crabtree earlier this week below.